Robert Flaherty (1884–1951) was the man credited with being the father of the modern documentary film after he produced and directed "Nanook of the North" in 1922. Flaherty is one of the great name directors in the history of cinema and to this day films such as "Nanook of the North", "Moana", "Man of Aran" and "Louisiana Story" are widely regarded as classics and still regularly screened. 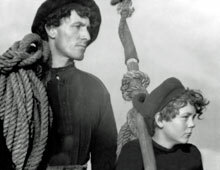 A BOATLOAD OF WILD IRISHMEN includes testimony from Flaherty himself as well as contributions from amongst others, Richard Leacock - cameraman on "Louisiana Story" (1948) and father of the contemporary hand-held documentary style, Martha Flaherty - Flaherty's Inuit granddaughter, George Stoney - documentary filmmaker and professor at New York University, Sean Crosson - film scholar at the Huston School of Film, Jay Ruby - anthropologist and film scholar at Temple University, and Deirdre Ni Chonghaile - musician and folklorist from Arainn, as well as telling interviews with the people whose parents and grandparents Flaherty put onto the cinema screens of the world: Inuit, Samoans and, of obvious personal interest to the Irish filmmakers, the 'wild men' of Aran. Robert Peary's quest to plant an American flag at the North Pole came with enormous, and sometimes unacknowledged, costs. Now his great-grandson wants to set the record straight.